A Burnley woman has been celebrating a jackpot “win” at bingo – after her boyfriend got down on one knee and proposed to her. Sharon Harrison took home a more valuable prize than she was hoping at the town’s Gala Bingo when brave Craig Hughes (28) asked for her hand in marriage. 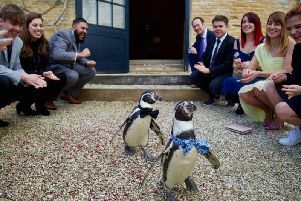 Surprised Sharon, who was celebrating her 30th birthday on the night, had no idea Craig was hiding a diamond ring and was going to pop the question. Luckily for him, she said “yes” immediately. “It was a very romantic moment, but I had no idea whatsoever. I was totally shocked,” she said. The couple live in Raglan Road, Burnley and have been together almost a year. Craig said he felt the moment was right to get engaged. He said: “Sharon enjoys going to the bingo with her dad, Stephen, on Thursday evenings. As she was celebrating her 30th that night, I decided to go along too, as well as our 20 family and friends who all knew that I was going to propose. “I warned Sharon that her name was going to be called out during the draw to walk on stage to collect a box of chocolates for her birthday. Once she had collected the chocolates, I was invited on stage and I could see Sharon’s face going bright red.